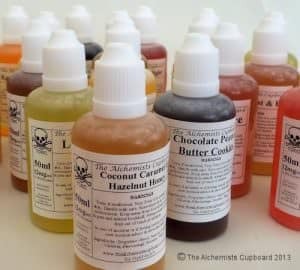 Why choose E-Liquid from the Alchemists Cupboard? We are the originators of our craft with over 6 years industry experience in making great E-Liquids and providing DIY mixing supplies. We were the first UK E-Liquid company to offer full transparency with our production facilities, showing YOU just how clean OUR liquids are. We prefer to lead the field, rather than follow. That means we dont sell generic E-Liquid flavours. Every Vape-Liquid you buy from us, is a Original Alchemist Recipe each batch is hand made by ourselves, here in the UK. We do not sell re-packaged, re-named or re-branded juice that has been made from the usual far east concentrates and re-bottled who knows where, and under who knows what conditions. All our Vape-liquid is made in our own Hepa 3 positive filtration Clean-room Laboratory, Batch recorded for your safety and ours. We lead the field in offering concentrates from ALL the leading Flavour-Houses, enabling you to make your own High-Quality E-Liquids to the levels of the professionals with ease & at the lowest prices in the UK. Originally designed for culinary uses, All Concentrates supplied from us are food safe, & have a multitude of uses, including: Cooking, Baking, Beverages & E-Cigs. All concentrates supplied are Re-Bottled in our own Hepa 3 positive filtration Clean-room Laboratory. Batch recorded for your safety and ours. *Our products do not contain Diacetyl. Product quality is paramount; our Vape-Liquids are made in small batches and by hand, with a personal touch in our own Cleanroom Laboratory and from the purest and best quality materials available. We purchase all our ingredients/concentrates direct from the manufactures in the UK, EU & USA, ensuring quality & control. All concentrates are food safe and considered safe to use for vaping purposes, once diluted. A top quality product, made from the best quality ingredients, in a high spec clean-room laboratory Give our juice a try & taste the difference. We also think that providing Five Star customer service is part of our success. We strive to ensure that all orders placed before 2pm (Mon-Fri) are processed & dispatched that very same day. Should we be able to assist in any way, with either your Mix, or simple advise on steeping, we are only ever a simple call away (in office hours).